Well it has been 3 months since I have moved up to Orem....wow how time flies. I finally get to move into my permanent apartment!! It is so much nicer than the one I have beem living in and it actually has a washer and dryer. However I have never done my own laundry before. Guess I will just have to learn, or bribe kara into doing it for me. 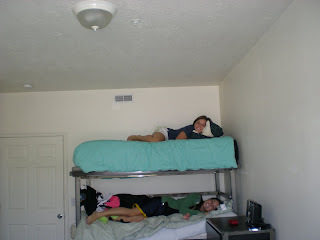 Did I mention that kara and I get bunkbeds? Yes that is right bunkbeds...it is going to be so much fun haha! However we built them ourselves and they are abnormally high bunkbeds. Kara and I both fear for our lives. Kara fears because they might collapse and squish her to death, and I fear because I am on the top and i might fall off....mind you it is like a twenty foot drop it seems like. It is also alot cleaner. I sure hope my roomamtes are not messy. I know it is kind of hard to believe but I enjoy cleaning my apartment and keeping it clean. When iI lived at home you would never hear me say that, nor did I clean or even like it. My mom always did that for me, so I had it easy. I can't stand messy roommates. These past three months have been horrible. I have had to live with one of the most disgusting girls ever. Boy am I glad to get away from her.